For quite some time, “wait for Vega” was the rallying cry of many AMD fans. After the R9 300 series of cards (with the 390X and the Fury cards offering quite a punch) in 2015, AMD backed off of the high-end market for a while. In 2016 they released their Polaris architecture under the RX 400 product line, with the RX 480 capping things off for a very reasonable $250 USD. Having had a 290/X and a 390/X in the previous generations, many fans were wondering what AMD had in store for the unannounced RX 490 card. Was this the mysterious, high-end Vega architecture that would replace the year-old R9 Fury cards? As the months wore on, AMD remained mum on the topic, and by the end of 2016 it became pretty clear that Vega would not be released as part of the 400 series of products. April of this year saw the release of the RX 500 cards (a modest refresh of the Polaris architecture), but once again there was no RX 590 offering in sight. Soon, though, AMD made it clear that Vega would be released as its own product category. 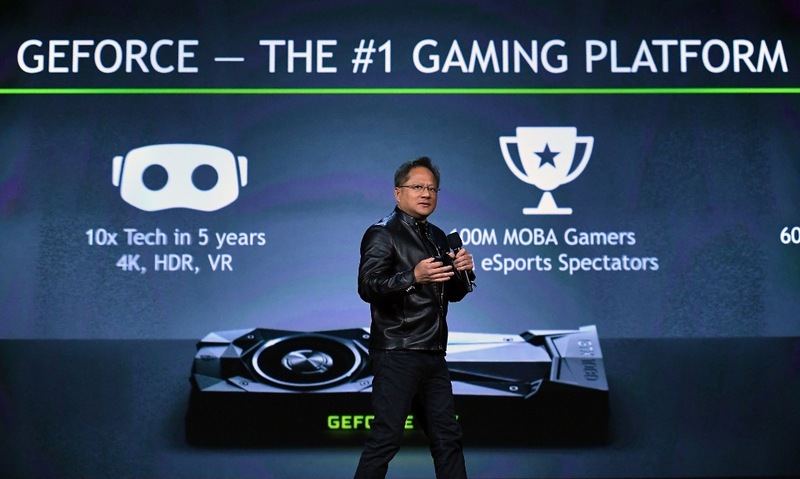 As far back as mid-2016, fans were saying that Vega would be the card to finally put NVIDIA in its place. Rumors were running wild about supposed specs for this next-generation card. It was clear that the card would make use of the next-generation High Bandwidth Memory 2 interface, but how much memory would be present and what speed the GPU would be clocked to were all pure speculation at best. The Polaris cards, while great for the money, were designed to appeal to mainstream PC gamers wanting to play at a solid 1080p or dip into 1440p a bit, but these GPUs were not meant to trade blows with the higher-end Pascal cards. Even the RX 580, which was marginally better than the R9 390X (though, to be fair, coming out almost two years later), would only compete with a GTX 1060. “Don’t worry,” fans said, “Vega will stomp the 1080. Vega will be a Titan-killer!” The problem was, though, when Vega was finally on the horizon this year, its performance claims were pitting it against cards that were nearly a year old, taking some of the wind out of their sails. Even though NVIDIA did refresh Pascal a bit this year with a faster GTX 1080 (featuring 11Gbps GDDR5X), Vega’s performance claims would pit it against the architecture from the previous production cycle. But now that Vega has actually been released, how does it hold up against its main competition? Honestly, things aren’t looking that great for Vega. As the release of the consumer RX Vega cards was getting close, performance showcases showed that Vega would trade blows with the GTX 1080. Knowing that more than one flavor of Vega would be released, it was unclear which version this was that was being shown. Some held out hope that it was more of a mid-tier Vega, with the “full Vega” being able to go toe-to-toe with the GTX 1080 Ti, but ultimately this turned out not to be the case. 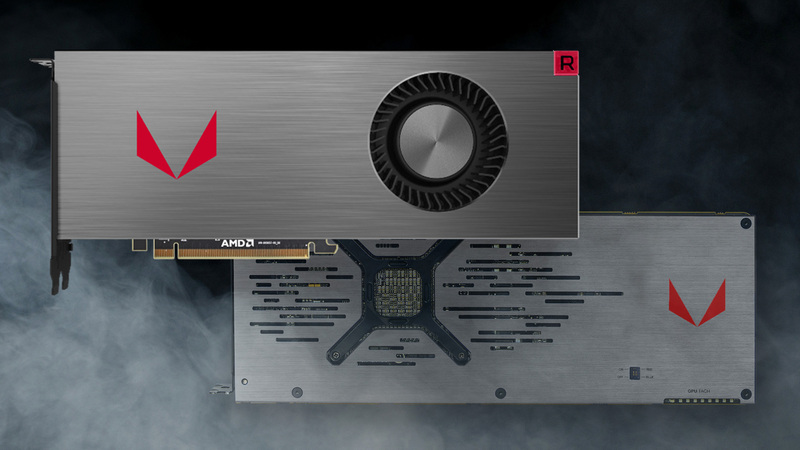 As it stands, the “full Vega” (referred to as RX Vega 64) was designed to compete with the GTX 1080, while the more cut down RX Vega 56 was designed as a GTX 1070 competitor. On paper, things actually looked pretty good. RX Vega 64 promised an MSRP of just $499 USD, meaning it would compete with a card that was $50 to $100 more than it, giving gamers some strong performance for their money (which has always been one of AMD’s goals). In the case of Vega 56, it would mean a $399 alternative to the GTX 1070 (which is a monster in the 1080p, 1440p, and VR markets) with a faster HBM2 memory interface as opposed to GDDR5. Unfortunately, though, on paper is where everything ends. Ultimately, RX Vega 64 does trade blows quite nicely with the GTX 1080, overall across several benchmarks; even though the RX Vega 64 has many individual games where it can be a GTX 1080, it also has a few where it comes in a good bit slower. Overall, it seems like the GTX 1080 is around 10% faster on average than the RX Vega. “But hey, that’s not too bad — GTX 1080 performance for less money!” This statement may seem like a valid response, but once you factor in the next two things, it’s really not. First, there’s the obviously higher power-draw of the RX Vega 64 versus the GTX 1080. Vega 64 has a TDP of 295W while the GTX 1080 comes in at just 180W. That’s a pretty significant difference, especially when you consider the fact that it’ll draw a lot more power than that if you attempt to overclock it. To drive this fact home, PC Gamer concluded that you could run two GTX 1080 cards in SLI and draw less power than RX Vega 64 under heavy loads. Then there’s the unavoidable fact that you can’t find Vega at anywhere close to its promised retail price. Vega production was exceptionally limited (something we knew would happen given the limited stock of HBM2 modules) and what few cards could be purchased at launch were immediately snapped up by cryptocurrency miners and after-market resellers. 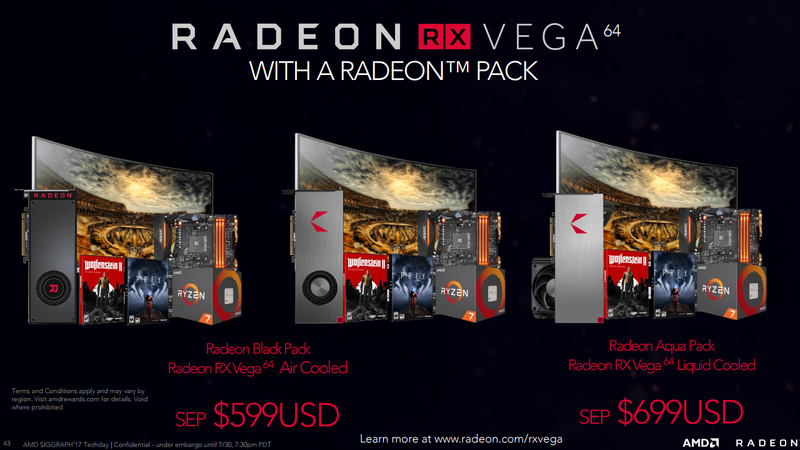 On NewEgg, it’s possible to snag an RX Vega 64 as part of the “Radeon Black Pack” that comes with a few extra goodies (intended to cut down on purchase from miners who didn’t care about gaming), but even this costs a minimum of $679.99 as opposed to the $599 MSRP suggested by Radeon. Ultimately, it comes down to the question of whether or not you need to upgrade your GPU right now. If you already have a GTX 1070 or 1080 (or beyond), you’re good to go: no reason to think about upgrades right now. If you’re dealing with older architecture (a GTX 900 series card, or an older AMD model) it may be a different story. Also, if you own an RX 480 and want to jump into the realm of higher resolutions, you may find yourself shopping around for a new card. At the end of the day, though, if you have nearly $700 to spend on a graphics card, RX Vega 64 doesn’t really offer a compelling reason to purchase it. You can get a GTX 1080 card for around $549, and not only will it draw much less power than the Vega 64, it’ll also outperform it around 10% of the time. If you are truly willing to spend $700 and think that you can stretch your budget a bit more, you may want to consider getting a GTX 1080 Ti — Vega 64 can’t even touch the performance of the Ti, and the Ti still consumes less power than the Vega! Still, as disappointing as Vega is in many ways, it’s kind of par for the course for AMD lately. The R9 290/X and 390/X were rather power-hungry cards, yet they had the advantage at least of being priced competitively with NVIDIA cards while offering some very solid performance. In this way, Vega feels like a bit of a step in the wrong direction, even despite some of its more advanced technology that’s powering it. On the plus side, though, AMD has shaken up the CPU market with its Ryzen processors and in that case, if nothing else, it should make pricing more competitive for those wanting to pick up a new CPU in the near future!